Welcome to Round 1! Our first Feature Match of the day is Table 194 where one of our Bounty Duelists, Paulo Gonclaves from Rio de Janeiro Brazil, is taking on Luiz Tobo Kanetaka from right here in Sao Paulo! Goncalves da Silva goes to almost every event in South America and was one of the highest World Qualifier Point earners during the 2018 World Championship season. He’s here today with his Sky Striker Deck while Tobo Kanetaka is playing Pendulum Magician with Zefra! For the first time this weekend, it’s time to Duel! Goncalves da Silva won the roll and elected to go first. He started with a hand of Foolish Burial Goods, Sky Striker Ace – Raye, Mystical Space Typhoon, Sky Striker Mecha – Widow Anchor and Twin Twisters. He activated Foolish Burial Goods and sent Metalfoes Fusion to the Graveyard which was immediately sent back to the Deck to draw Sky Striker Mecha Modules – Multirole. He then Normal Summoned Sky Striker Ace – Raye and sent it to the Graveyard to Link Summon Sky Striker Ace – Shizuku. He activated Sky Striker Mecha Modules – Multirole, Set 2 cards to the back and in the End Phase used Sky Striker Ace – Shizuku’s effect to add Sky Striker Mobilize – Engage! from his Deck to his hand. Tobo Kanetaka activated Oracle of Zefra! Goncalves da Silva chained Mystical Space Typhoon to destroy the Field Spell, preventing Tobo Kanetaka from adding a Zefra card from his Deck to his hand. Tobo Kanetaka then activated Chronograph Sorcerer and used its effect, destroying to to Special Summon Timegazer Magician from his Deck. He then activated another Chronograph Sorcerer from his hand using its monster effect to Special Summon it and Mythical Beast Master Cerberus from his hand. Tobo Kanetaka Set a card to the back and sent Timegazer Magician and Chronograph Sorcerer to the Graveyard to Link Summon Heavymetalfoes Electrumite. Tobo Kanetaka tried to use the on-summon effect but Goncalves da Silva chained his Set Sky Striker Mecha – Widow Anchor to negate that effect. Tobo Kanetaka then activated Zefraniu, Secret of the Yang Zing to the Pendulum Zone to give Mythical Beast Master Cerberus 2 Spell Counters. 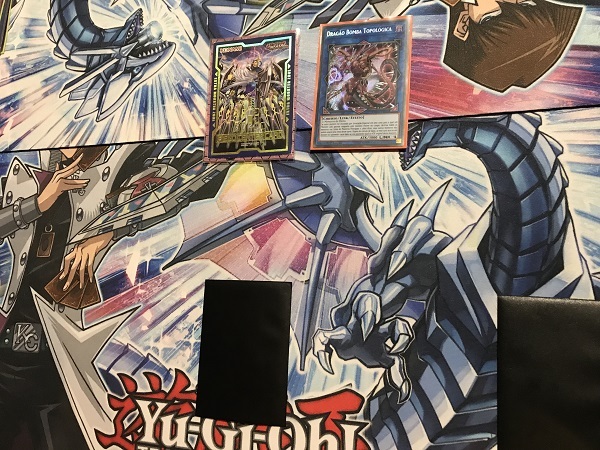 Mythical Beast Master Cerberus attacked and destroyed Goncalves da Silva’s Shizuku allowing Goncalves da Silva to activate Sky Striker Ace – Raye’s effect from the Graveyard, Special Summoning it from the Graveyard. Still in the Battle Phase, Goncalves da Silva used Sky Striker Ace – Raye’s effect, Tributing it to Special Summon Sky Striker Ace – Kagari from the Extra Deck. Kagari’s effect let Goncalves da Silva add Sky Striker Mecha – Widow Anchor from the Graveyard back to his hand. Tobo Kanetaka sent Heavymetalfoes Electrumite to attack and destroy Goncalves da Silva’s Sky Striker Ace – Kagari. Goncalves da Silva drew Mystical Space Typhoon. Tobo Kanetaka activated the set Zefra War, destroying his own Zefraniu, Secret of the Yang Zing and Goncalves da Silva’s Sky Striker Mecha Modules – Multirole. In the Main Phase, Goncalves da Silva activated Sky Striker Mobilize – Engage!, adding Sky Striker Mecha – Hornet Drones and drawing Upstart Goblin. He activated Upstart Goblin, drawing Terraforming and giving Tobo Kanetaka 1000 LP. 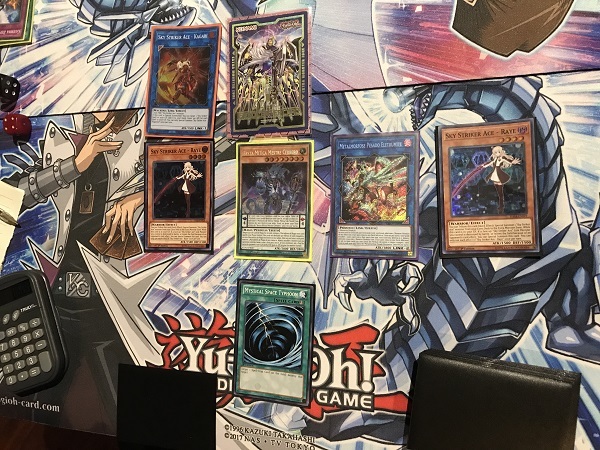 He activated Terraforming to add Sky Striker Airspace – Area Zero from his Deck to his hand and giving Tobo Kanetaka’s Mythical Beast Master Cerberus a total of 6 Spell Counters. Goncalves da Silva then activated Sky Striker Mecha – Hornet Drones to Special Summon a Sky Striker Ace Token, then used the Token to Link Summon Sky Striker Ace – Kagari which picked up Sky Striker Mobilize – Engage! from the Graveyard which was activated to add Sky Striker Mecha – Widow Anchor and draw another Sky Striker Mobilize – Engage! which was immediately activated to Tobo Kanetaka’s chagrin. 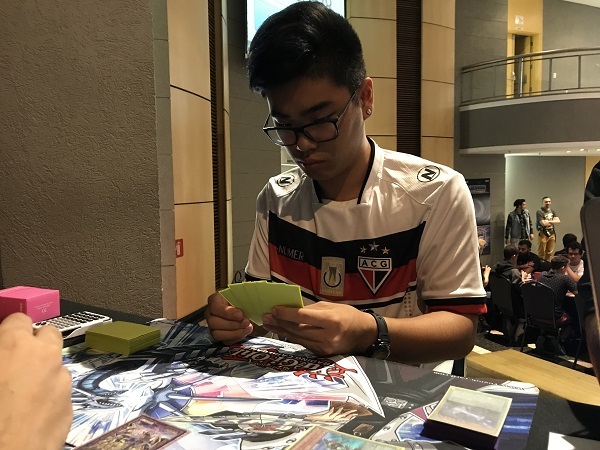 Goncalves da Silva added Sky Striker Ace – Raye from his Deck to his hand and declined to draw for reasons that will become apparent. Goncalves da Silva then activated both of his Sky Striker Mecha – Widow Anchors in a Chain, taking control of both of Tobo Kanetaka’s monsters (Heavymetalfoes Electrumite and Mythical Beast Master Cerberus). He Normal Summoned Sky Striker Ace – Raye and attacked with all 4 monsters, then in the Battle Phase, he activated Mystical Space Typhoon to destroy his own Sky Striker Airspace – Area Zero which allowed Goncalves da Silva to Special Summon another Sky Striker Ace – Raye from his Deck, allowing the last attack to end the first Duel! “I didn’t want to draw the last Sky Striker Ace – Raye in the Deck!”, Goncalves da Silva explained after the Duel ended. Tobo Kanetaka elected to go first. He started with Chronograph Sorcerer in the Pendulum Zone, using its effect to destroy itself to Special Summon Timegazer Magician from the Deck. He then Normal Summoned Satellarknight Zefrathuban then used both monsters to Link Summon Heavymetalfoes Electrumite and tried to use its effect but Goncalves da Silva chained Infinite Impermanence from his hand to negate Heavymetalfoes Electrumite’s effect. Goncalves da Silva drew Mind Control to add to his hand of Ash Blossom & Joyous Spring, Mystical Space Typhoon, Reinforcement of the Army and Sky Striker Mecha Modules – Multirole. he activated Reinforcement of the Army to add Sky Striker Ace – Raye from his Deck to his hand. Goncalves da Silva Normal Summoned Sky Striker Ace – Raye then activated Mind Control to take control of Tobo Kanetaka’s Heavymetalfoes Electrumite. Sky Striker Ace – Raye attacked directly for 1500, then in the Battle Phase, Goncalves da Silva used Sky Striker Ace – Raye’s effect, Tributing it to Special Summon Sky Striker Ace – Hayate form the Extra Deck. Sky Striker Ace – Hayate connected for another 1500 and Goncalves da Silva used Hayate’s effect to send Sky Striker Mobilize – Engage! form the Deck to the Graveyard. In Main Phase 2, Goncalves da Silva activated Sky Striker Mecha Modules – Multirole. He tried to use Sky Striker Mecha Modules – Multirole’s effect to send a card to the Graveyard but Tobo Kanetaka chained Ghost Ogre & Snow Rabbit from his hand to destroy Multirole and prevent Heavymetalfoes Electrumite from being sent to the Graveyard. Sky Striker Ace – Hayate switched out for Sky Striker Ace – Kagari whose effect added Sky Striker Mobilize – Engage! from Goncalves da Silva’s Graveyard to his hand. He then used Sky Striker Ace – Kagari and the stolen Heavymetalfoes Electrumite to Link Summon Knightmare Unicorn. With his Main Monster Zones cleared, Goncalves da Silva activated Sky Striker Mobilize – Engage!, adding Sky Striker Mecha – Widow Anchor and drawing another Infinite Impermanence. He Set those 2 cards along with Mystical Space Typhoon and passed. Tobo Kanetaka Set a monster and a backrow and passed, but Goncalves da Silva blasted the Set Nine Pillars of the Yang Zing with Mystical Space Typhoon. Goncalves da Silva drew Mind Control. He activated it to take control of Tobo Kanetaka’s face-down Harmonizing Magician. He Flip Summoned it used it and Knightmare Unicorn to Link Summon Topologic Bomber Dragon. He attacked directly with it for 3000 damage, leaving Tobo Kanetaka at 2000 LP. Tobo Kanetaka drew and passed, allowing Goncalves da Silva to attack directly with Topologic Bomber Dragon to end the match! Paulo Roberto Goncalves da Silva takes the first Round in decisive fashion! 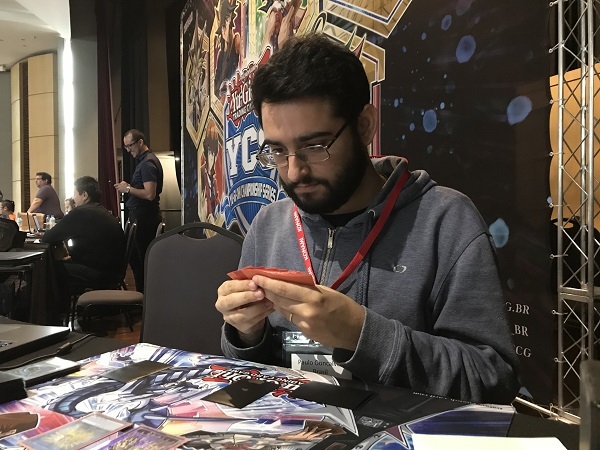 YCS Sao Paulo: Round 3 Pairings Welcome to Yu-Gi-Oh! Championship Series São Paulo!